Seven Nights is a ride through the city, a graduating exam unlike any other, a last gasp in the slipstream of youth. It’s night time, and a young man sits at a table, writing. He’s afraid. Afraid of having to decide – on a woman, a group of friends, an annual holiday destination. He’s afraid of becoming numb to emotion. Of growing up. But an acquaintance has made him an offer: seven times at seven o’clock, he’s got to commit one of the seven deadly sins. He must be avaricious, proud and lustful, throw himself off a high-rise building, lose his faith and all sense of proportion. 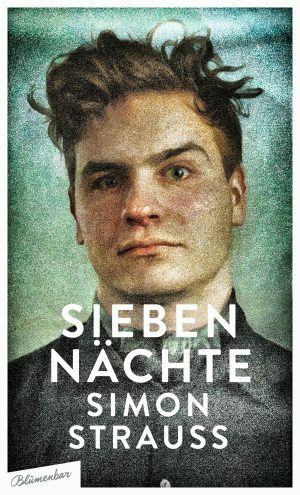 Simon Strauß depicts a young man on the edge, a man who will do anything to stave off habit and ennui. His task? To be avaricious, proud and lazy, to feel envy and anger, gluttony and lust. To abandon himself to life so that he doesn’t lose his emotional sensitivity. Under cover of darkness, he sketches the outline of a better world, a more intense way of living, drawn from his experience of the seven deadly sins. 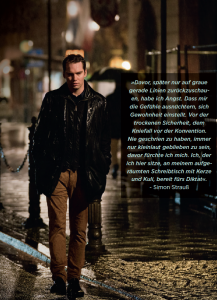 Simon Strauß, born in 1988 in Berlin, studied Classics and History in Basel, Politiers and Cambridge. In 2017 he completed his doctorate at Humboldt University in Berlin, with a thesis on “Conceptions of Roman Society in Theodor Mommsen and Matthias Gelzer”. He lives in Frankfurt, working as an editor for the arts section of the Frankfurter Allgemeine Zeitung.